There’s something for everyone during Pride season. Once again this year, the U of T Pride and Remembrance Run Team will hit the pavement in support of local LGBTQ charitable organizations – there are some great ones as always – we would love for you (and your colleagues, friends, and family) to join us! Everyone is welcome! 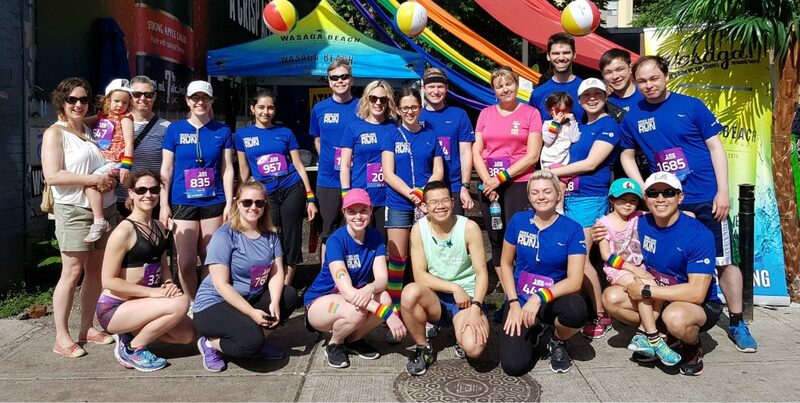 By joining our team you’ll meet a great group of people, experience some Saturday morning Pride excitement, and get a great t-shirt, all while helping to fundraise for local LGBTQ charitable organizations – check them out! While we are proud to have been among the top fundraising teams over the past few years, fundraising is completely optional and everyone is welcome whether or not they plan to raise funds. The 5 km Run (or 3 km walk) circles twice around Queens Park Crescent (once for the walkers) and then finishes back at the corner of Church and Wellesley streets. Following the Run, there are snacks and a celebration at Barbara Hall Park next to The 519 Church Street Community Centre. More info on the event. To join, visit our Team Page and click on the “Join the Team” button on the right side of the page. Registration costs only $40 until April 30, $45 until May 31, and $50 after that, so register early and save! We want to make sure that everyone can participate in the Run – if the registration costs are a barrier, please email the Sexual & Gender Diversity Office at sgdo@utoronto.ca to find out about sponsorship options. Can’t join us? Please consider sponsoring the team to help us make an important contribution to Toronto’s LGBTQ communities. Thank you very much for your support! If you have any questions, please don’t hesitate to contact team captain Janet Koecher at janet.koecher@utoronto.ca. Donate to and/ or join the U of T Pride & Remembrance Run Team.